LONDON (Reuters) - British lawmakers launched an inquiry on Friday to plot the best way forward for finance after Brexit as Goldman Sachs warned it could cut jobs if the United Kingdom crashes out of the bloc without an agreement in two months' time. The inquiry will determine if the country should track European Union rules or cut loose to best serve its financial sector after Brexit. Finance is Britain's biggest tax raising sector, earning government coffers more than 70 billion pounds ($91 billion) each year, and the EU is the sector's largest single customer. "London is the world's premier financial centre, and many of us want to keep it that way," Treasury Select Committee chair Nicky Morgan said in a statement. Britain has yet to secure a divorce settlement with the EU to avoid leaving the bloc on March 29 without any framework, leaving banks, insurers, asset managers and trading platforms in Britain with European customers scrambling to open new EU hubs. 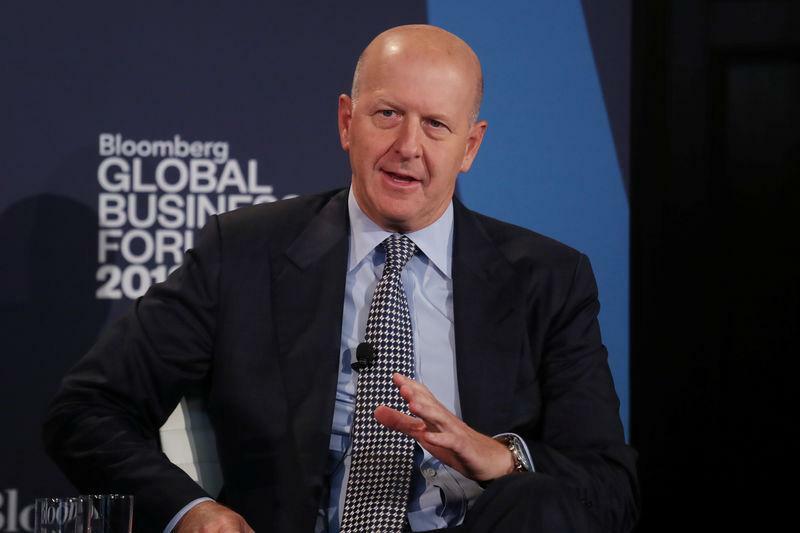 Goldman Sachs Chief Executive Officer David Solomon told the BBC in Davos that the bank would invest less in Britain if there is a difficult or hard Brexit. "But I would say that, over time, if this is resolved in a difficult way or a hard way, it'll have an impact on where we invest and where we put people," Solomon said. A vote in parliament next Tuesday could take a no-deal Brexit off the table, but it would remain unclear what would replace it. Supporters of Brexit say departure from the EU is an opportunity to trim the rulebook and keep the City of London competitive as a global financial hub. British regulators want to stay aligned with the EU and have ruled out a "bonfire" of regulations, warning about the perils of "light touch" rules that led to the financial crisis. The committee said on Friday it will look at what Britain's priorities should be when it negotiates future trading relations with the EU and other countries. The EU has said that Britain's financial sector faces the same patchy and unpredictable system of market access as other non-EU countries like the United States and Japan. Brussels grants access to foreign financial firms if their home regulation stays "equivalent" or closely aligned with the bloc's own rules, a determination that has no timetable. Miles Celic, chief executive of TheCityUK, which promotes Britain's financial services abroad, said there is no appetite in the industry to take a bulldozer to current rules. "The UK’s reputation for quality regulation and high standards is a key competitive advantage," Celic said. Stephen Jones, head of UK Finance, a banking industry body, said Britain must avoid fragmenting markets. "We also need to ensure the UK’s tax policy is globally competitive," Jones said. The committee will make recommendations to the government and regulators.